We saw an example of how to use workflow with Liferay web content in chapter 2. In this section, we’ll discuss how to use workflow with other applications. First, we’ll look at using workflow with Documents and Media. After that, we’ll look at using workflow with Blogs, Wikis, and Message Boards. You can enable workflow for most portal resources, including page revisions for staging, web content, and collaborative applications, from the Control Panel. However, workflow for Documents and Media can only be enabled within a Documents and Media portlet since it must be defined at the folder level. To see how this works, create a new page in the default site called Documents and Media and add the Documents and Media portlet to this page. Then click Add → Folder, enter the name My Documents, and click Save. Mouse over your new My Documents folder, click on the gray icon that appears at the top right corner of the folder, and select Edit. 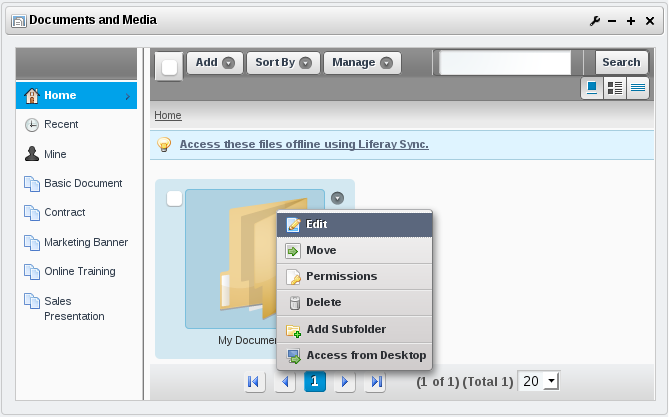 Figure 10.9: Workflow for Documents and Media must be enabled at the folder level. Edit a folder to select a workflow. By default, the Use document type restrictions and workflow of the parent folder button is selected. To enable workflow for this folder, select the Define specific document type restrictions and workflow for this folder button. After you’ve selected this button, a Default Workflow for all Document Types drop-down menu appears. By default, you can select No workflow or Single Approver. Any custom workflows that you added also appear in this drop-down menu. You can add custom workflows through the Workflow page in the Portal section of the Control Panel. 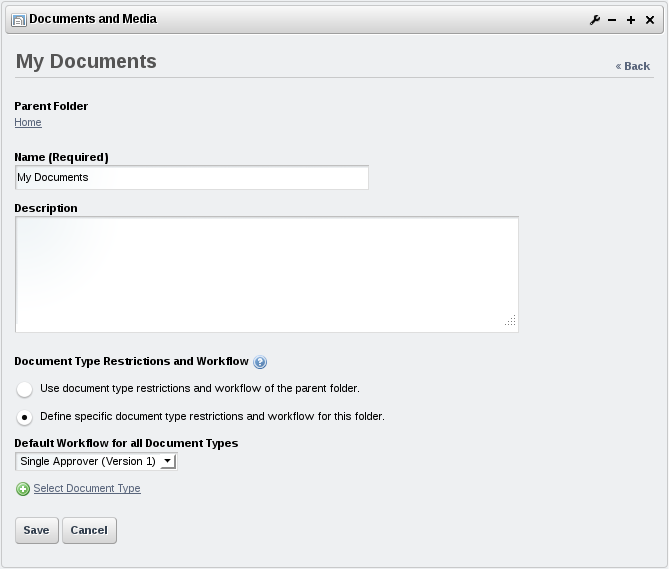 Figure 10.10: You can use the document type restrictions and workflow of the parent folder or you can define specific document type restrictions and workflow for this folder. After you’ve selected the Single Approver workflow and clicked Save, workflow takes effect for the My Documents folder. Try adding a new document to your My Documents folder–notice that the Publish button now says Submit for Publication since workflow is enabled. Any users assigned to the (Portal, Organization, or Site) Content Reviewer roles can see that your document has been submitted for publication by navigating to the Control Panel and clicking on My Workflow Tasks. Ordinarily, the same user who submitted a document for publication wouldn’t also approve it but we’ll do this to demonstrate how the process works. Navigate to the Control Panel and click on My Workflow Tasks. The document that you submitted for publication appears under Assigned to My Roles since you’re an administrator. Click Actions → Assign to Me next to your document. Then click Actions → Approve next to the document when it appears in the Assigned to Me category. That’s it–your document has passed through the workflow! To enable workflow for collaborative applications, first navigate to the Control Panel and select a scope in the context menu selector. You can enable workflow globally, or for a specific site. 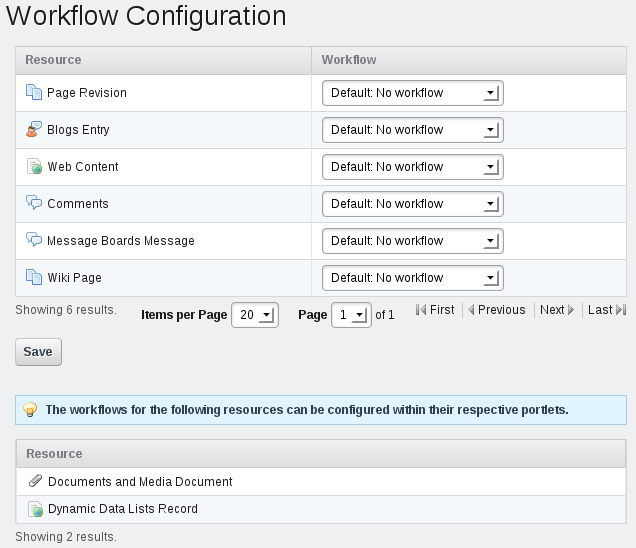 Once you’ve chosen a scope, click on Workflow Configuration in the content section of the Control Panel. This page lists the portal resources for which you can select a workflow. Figure 10.11: The Workflow Configuration page of the Control Panel lists the resources for which can select a workflow for your chosen scope. To select a workflow, click on the Workflow drop-down menu and choose a workflow. By default, you can only select No workflow or Single Approver. Custom workflows that you added also appear in this drop-down menu. You can add custom workflows through the Workflow page in the Portal section of the Control Panel. To enable workflow for the collaborative applications, select the Single Approver for the Blogs Entry, Message Boards Message and Wiki Page resources, then click Save. To test the workflow for collaborative applications, add a page called Collaboration to the site whose scope you selected when you enabled workflow. Then add the Blogs, Message Boards, and Wiki portlets to this page. Using each portlet, add a blog entry, post a new message board thread, and write some content for the Wiki frontpage. For each application, notice that the Publish button is replaced by a Submit for Publication button since workflow is enabled. The workflow process for collaborative applications works the same way as in the examples you’ve already seen. Any users assigned to the (Portal, Organization, or Site) Content Reviewer roles can see that your blog post, message board thread, and wiki article have been submitted for publication by navigating to the Control Panel and clicking on My Workflow Tasks. Of course, since you submitted these items for publication, it wouldn’t make sense in a real-world use case for you to approve them. However, to see how the workflow process works, go ahead and approve these items yourself; you can do this since you’re an administrator. Navigate to the Control Panel and click on My Workflow Tasks. The items you’ve submitted for publication appear under Assigned to My Roles. Click Actions → Assign to Me next to the items you’ve submitted. Then click Actions → Approve next to each item when it appears in the Assigned to Me category. That’s it–your blog post, message board thread, and wiki article have passed through the workflow!